When I get a new magazine I always flip to the back. Is it the instant gratification of a quick, witty article or was I so well trained by Seventeen Magazine to read my horoscope back in the 7th grade? The last time I flipped to the back of one of my favorite magazines I realized how much I love the feature of what is inside celebrity purses. I thought it would be fun to share what's inside MY Disney Park bag. If you are a Disney Park veteran it will be fun to compare! If you are planning your first trip maybe this will help you decide what essentials to pack. *Match the numbers below to the picture above. 2- BandAids- (Disney Band Aids) and Blister Band Aids- are magic if anyone gets a blister from all the walking! 3- Clean & Clear Oil Absorbing Sheets- Absolutely essential in the humid Florida weather. 4- Tide to Go- I always carry one of these. With so many photo-ops you can't afford to get a stain front and center. 5- Anti-Bacterial Hand Gel- my fave is Pocket Bac by Bath and Body Works. 6- Travel Size Hand Lotion- I normally pick a scent from Bath & Body Works and buy a shower gel, lotion, and mini spray for the trip. Later, when I am feeling Disney withdrawal I close my eyes and via my trip-scent I am instantly transported back to the Magic Kingdom. 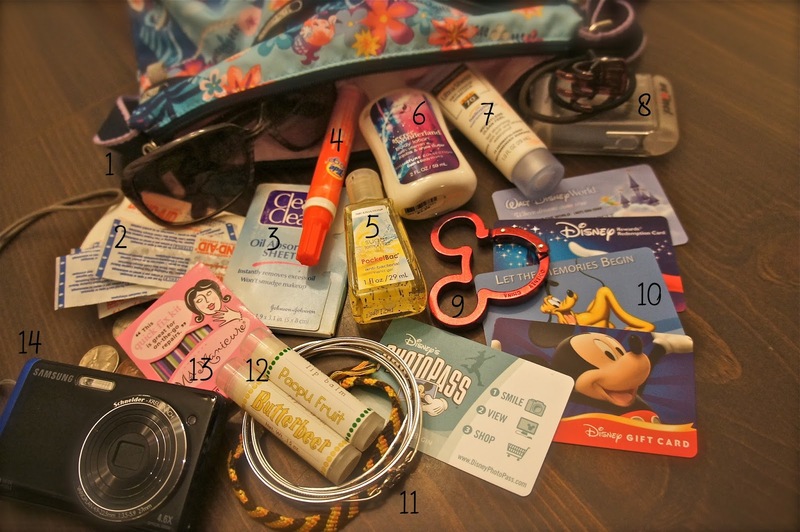 7- Sunscreen- You cannot survive in Disney without it. 8- Hair accessories- A couple elastics, a few bobbie pins, and a clip. 9- Carabiner- I have a Mickey shaped one! I like to clip a carabiner to my bag and then on the way out of the hotel in the morning as I sip coffee or tea from my refill mug I don't have to worry about what to do when I am done. I make sure its empty, close the lid, clip it on and I am hands free! 12- Chapstick- I am in love with Lip Smackers- particularly Dr. Pepper flavor. 13- Ms. Manicure mini nail files- the size of a matchbook and come in handy! 14- Compact Digital Camera- I always have a small camera in my bag with extra memory cards...JUST IN CASE. Trust me, you do not want to buy a new card or battery in the park! 15- Park Maps and a time guide- Always the first thing I grab on my way into a park. 16- Gum, mints and a granola bar for quick snacks on the run. 17- Ponchos! I alway grab disposable ponchos from Coleman or one of the other camping brands when I see them in Target. They are super compact and under $1! I bring about 6 each trip so we can toss them after the storm passes. What didn't make the cut in my bag that is a must for you? Drop me a line to let me know! I totally bring a ziploc too! Great minds think alike! I use the ziploc I pack all my toiletries in for TSA actually! lol! All that, minus bracelets, and add baby wipes! They are good if you are hot, sticky, a bit dirty, spill something on your clothes...Ziploc too. Love that you mentioned change for pressed pennies! Usually have 1 towel as well in case someone gets extra wet on a ride, sits on a wet seat, etc.